DC’s “Zero Hour” event didn’t just lead to a new team in the pages of New Titans, it also de-aged Ray Palmer, aka the Atom, into a teenager. 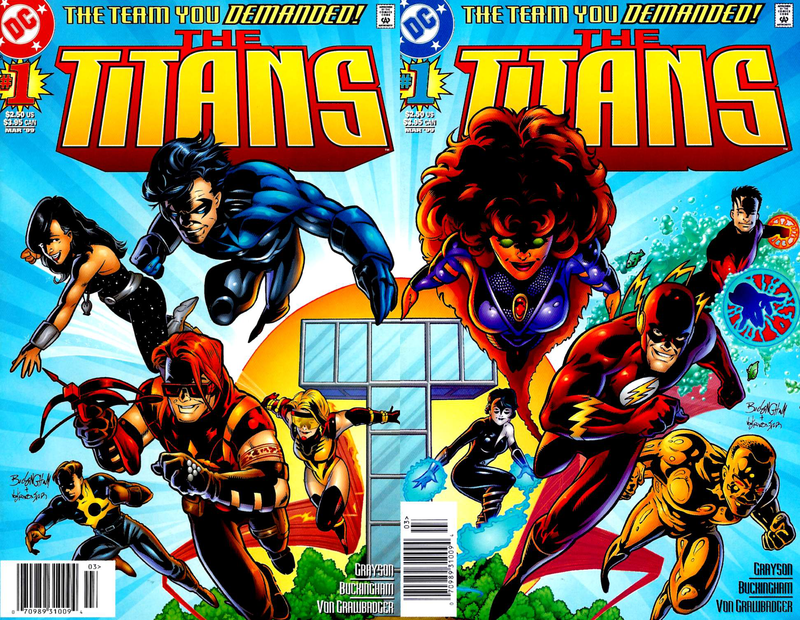 Given how long time characters were being drastically changed left and right in the 90s, I don’t know if the Titans were the reason for this change. This entirely new group of Teen Titans was made up of alien/human hybrids with superpowers who don’t know they’re alien/human hybrids. And while the aliens’ point of origin was never made totally clear, I seem to remember it being implied that they were from Titan, one of the moons around Saturn, which would have made these characters half-Titans. The series wasn’t bad per se, but creating a Teen Titans team without, at the very least, any of the familiar names was a hard sell. The roster expanded to include more established characters and the original Titans showed up, but the book still felt like an aberration. And, let’s face facts, the Atom should be on the Justice League. The book was written and penciled by Dan Jurgens, whose art I’ve always enjoyed. George Perez inked 11 issues of the 24 issue run, so it looked amazing. It was just too far from left field to survive. To my knowledge, this series featured the first time Roy Harper took on the persona of Red Arrow, which, in my eyes, was ultimately his best superhero identity. So it had that going for it. But none of these characters were or had ever been sidekicks. Their connections to the rest of the DCU was tenuous at best. Regardless of the fact that four of the five of them were new characters, they didn’t carry on any of the themes of a group calling themselves the Teen Titans. It was just another book about teenagers with powers and those were a dime a dozen. Two and a half years later, the Titans returned, this time at odds with their mentors in the Justice League in the appropriately titled “JLA/Titans” limited series. Devin Grayson, Phil Jimenez, and Andy Lanning told what was perhaps one of the most epic Titans stories of all time, one that involved every character that had ever been a member of the team. This was the first time a clear distinction was made between the “founders” and everyone else, which was interesting given that the most popular incarnation of the team was made up of more non-founders than founders. But the focus on the founding five was meant to underscore the generational component of the team. Nightwing had to face off against Batman, just as Tempest (formerly Aqualad) had to face off against Aquaman, and so on. Again, what made this team unique in all of comics is that it was formed by (now former) sidekicks. That’s where the tension came from. For as epic as this story was, it was simply bringing the series back to basics. As soon as the limited series was over, a new Titans ongoing launched, this time simply called “The Titans.” No more adjectives for this bunch. 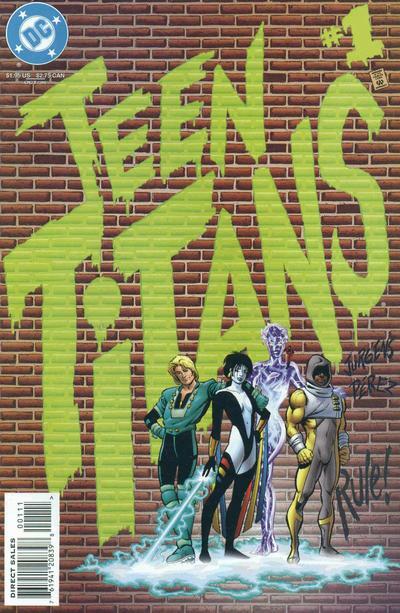 It was written by Devin Grayson and drawn by Mark Buckingham and Wade Von Grawbadger and, for those who loved the Titans, started off really strong, despite a fairly ridiculous initial conceit. I love team building stories. I love when a core group sits around and debates the relative merits of potential new teammates. I absolutely love them. I wish they happened more often. And while there’s a lot to love about the team building story that opens this series, it ultimately comes across as unnatural. The idea that the core five would decide to reunite, and then decide that they should all choose “seconds” who will help fill out the team when they’re not available is sound, particularly since the Flash was already in the Justice League at this point. Arsenal choosing Damage because he owed him had its roots in the previous series, so that made sense. Flash picking Jesse Quick was a bit out of left field, but made sense if you’d been reading his solo title. Tempest picking Cyborg made no sense. He was the founder with arguably the least amount of contact with Vic. Troia choosing Argent made even less sense, particularly if they were looking at everyone who’d ever been a Titan as an option (I recently read an interview with Grayson where she says Argent was added because of editorial decree). Nightwing picking Starfire at least made some sense. That said, the interaction between the founding five over the course of Grayson’s run on the book was better than it had ever been. The stories weren’t particularly inspired (the less said about Goth, the better), but the character interaction was always great. Grayson and Buckingham don’t make it past #20, though, and were replaced by Jay Faerber and Paul Pelletier. The series got bogged down in a storyline about orphans on the run from the DEO. By the time Tom Peyer took over the writing chores, the book had lost all the momentum from the launch and the now six member team had gotten stale. The title was canceled with issue #50 to make way for a new series, focusing on the next generation of teen heroes. The cancellation of Titans went hand in hand with the end of Young Justice (a much beloved title that should have been the Teen Titans from the start), as the two books merged into a limited series called “Titans/Young Justice: Graduation Day.” As the title suggests, the series was about growing up. 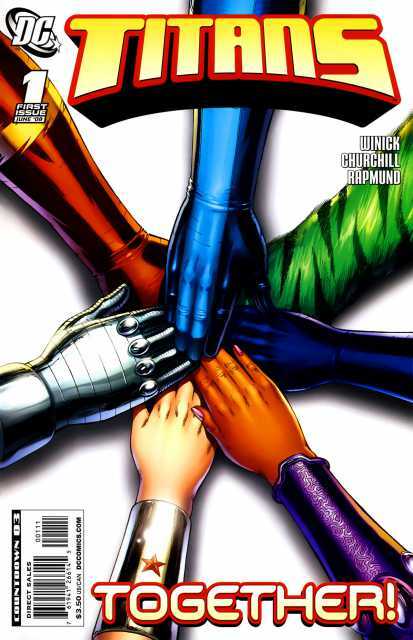 Both groups came out of the series in a darker place, particularly those of Young Justice. In the end, Donna Troy died and the teams broke up. In the aftermath came a new Outsiders series for the twentysomething crowd, and a new Teen Titans series for the teenagers. This would prove to be the second longest running series for the Titans, and with good reason: the focus returned to teenagers, specifically teenagers who were sidekicks/legacy characters. Digression: I don’t understand DC. I understand that they want Cyborg to be a member of the Justice League and that they want people to appreciate Aquaman or even Martian Manhunter, but when it comes to the DCU, their core is the five families: Superman, Batman, Wonder Woman, Flash, and Green Lantern. These five characters have spawned entire families of characters and books. This is the DC universe and it should be the starting point for everything they do, if for no other reason than they’re recognizable and, thus, marketable. 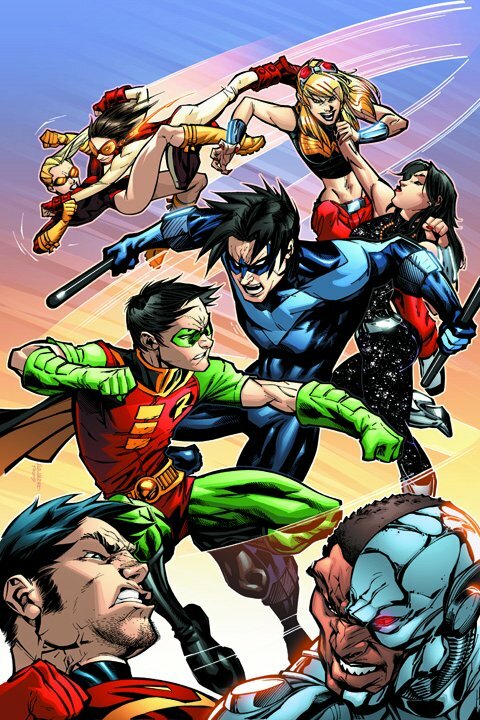 Bringing it back to the return of the Teen Titans, Geoff Johns, Mike McKone, and Marlo Alquiza very smartly recreated a core group of teens that were all members of one of the five families: Robin, Superboy, Wonder Girl, and Kid Flash. And because only Robin had his own series, Johns could do what he wanted with the rest of them, giving the Teen Titans series more depth than the Justice League title featuring their mentors. It was a controversial move at the time, but I loved that they turned Impulse into Kid Flash. I read the Flash family of books when Impulse arrived and I understood his appeal. I even enjoyed his stories. But at a certain point, it got old. I know that some fans saw this as yet another move to make a light hearted character dark, but it worked as the evolution of the character. Making him Kid Flash was a wonderful way to bring him into the fold with the other legacy characters. The addition of Cyborg, Starfire, and Beast Boy was also nicely done. Having been Teen Titans themselves, they understood the need for the team, but they also understood that some adult supervision would go a long way. The fact that it was these three characters made a lot of sense, as the original team had all grown up and were less than positive about the whole idea of teenage superheroes. Johns has a well earned reputation for maiming characters in ridiculous ways, but he’s also fairly diligent in bringing back characters he grew up with. In this case, it meant bringing back both Raven and Jericho. The Raven resurrection worked surprisingly well. She never really had a childhood, so making her a teen again worked. Making her a goth was just kind of hilarious, but not in a bad way. Jericho’s return was bit more problematic, mostly because he’s not really a teen and his sole connection to the team was ultimately his sister, Rose aka Ravager. Johns (and every writer after him) really, really want us to like Ravager, so much so that it felt forced. 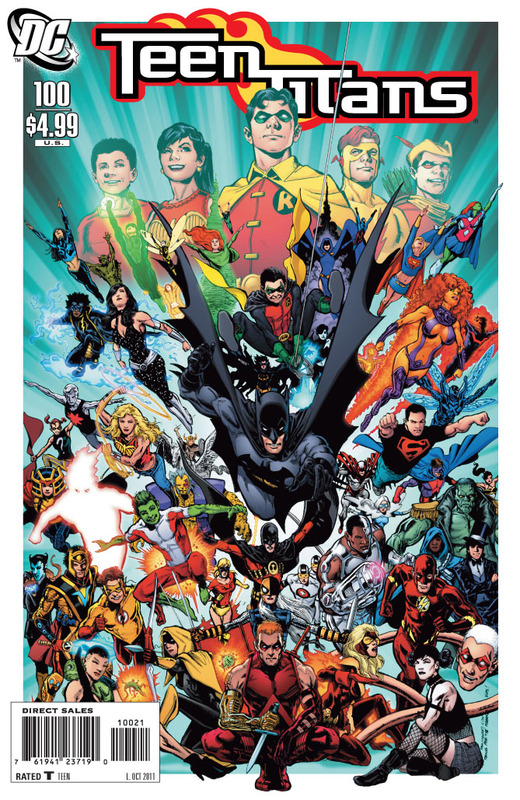 The decision to create dozens of new legacy characters during the one year gap watered down the field considerably, although Miss Martian paid off on the Young Justice cartoon. As seems to happen with everything Johns writes, the book fell apart when he left. The cast never really stabilized and was regularly made up of what could generously be called b-listers. The additions of Static and Blue Beetle were highlights, but ultimately wasted. 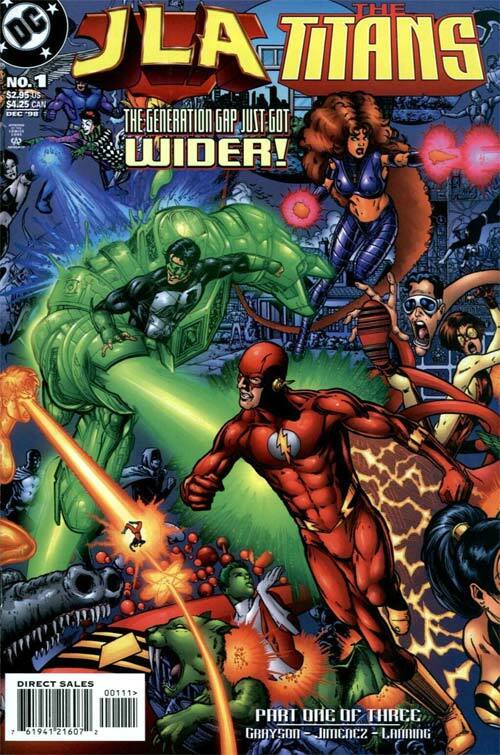 The series ended at #100 in advance of the New 52. The Robin/Kid Flash/Wonder Girl/Superboy Teen Titans were born out of the events of the “Graduation Day” limited series, which also led to the birth of a new Outsiders series — the twentysomething team. But the book featured more new characters than established ones; don’t even get me started on how Metamorpho was Metamorpho but not really. The book was eventually changed to a new iteration of Batman and the Outsiders, leaving the former Titans who had been on the team (Nightwing, Arsenal, and, eventually, Starfire) free to move to a new Titans book. Simply called Titans, the new title was the reunion book fans had been clamoring for: the original five of Nightwing, Donna Troy, Tempest, Flash, and Arsenal, plus the second wave of Cyborg, Beast Boy, Starfire, and Raven. It was nostalgia on eleven. The book initially suffered from a convoluted story that made Jericho an unwilling villain. After that, it seemed to have a new creative team every issue, eventually just treading water until it was completely revamped with a team of villains led by Deathstroke. It didn’t last much past that point, and is mostly remembered as the comic where new Atom Ryan Choi was unceremoniously murdered. The series underscored a concern I had long had about the Titans: nostalgia was killing it. The book could never seem to move past the Wolfman/Perez era. Whenever the title needed a sales boost, the old team was put back together. All of this was soon wiped away, though, as DC decided to reboot their shared universe.